Fri., March 16, 2018, 8:31 p.m.
SAN DIEGO – Jevon Carter scored 21 points, had eight assists and six steals, Teddy Allen added 16 points and No. 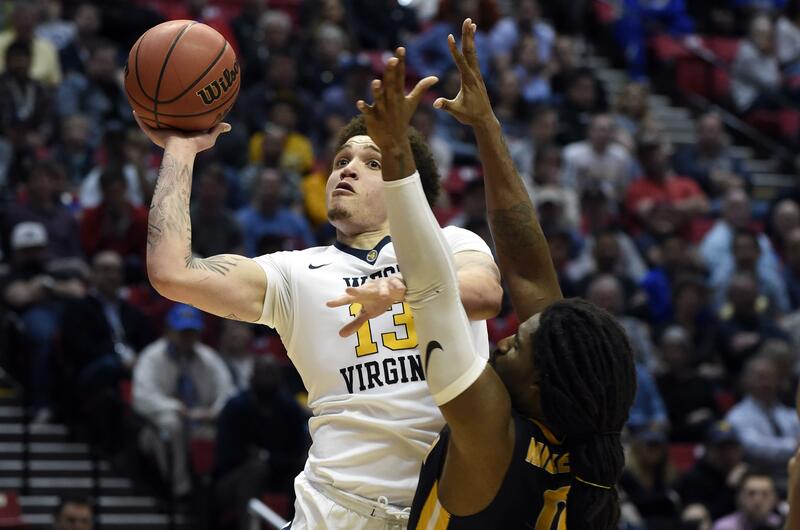 5 seed West Virginia overwhelmed 12th-seeded Murray State 85-68 in the first round of the East Region on Friday. The Mountaineers (25-10) pulled away in the second half and advanced to the round of 32 for the third time in the past four seasons as four players finished in double figures. Next up for West Virginia: A Mountain State showdown with 13th-seeded Marshall far away from home. Carter had 13 points in the second half and was the trigger of a second-half surge by the Mountaineers after Murray State had trimmed a 14-point lead down to five. Terrell Miller led Murray State (26-6) with 27 points, but he was the only Racers player to shoot well. Miller made 8 of 11 shots, but his team hit just 41 percent. Murray State had won 13 straight games entering the NCAAs, the second-longest active win streak in the country. More important than what Carter did offensively was the job he and his teammates did on the defensive end shutting down Murray State star Jonathan Stark. It was Stark who carried the offensive load all season for the Racers. Stark had scored in double figures in 30 of 31 games entering the NCAAs, including three games of 30 or more points late in the season. But Stark never found his shot from the outside and anytime he beat his defender there were Mountaineers waiting. Stark, who was averaging 21.8 points per game, was 1 of 12 shooting and finished with nine points. Murray State lingered long enough to at least make the Mountaineers work. Down by 14 early in the second half the Racers rallied, pulling within 49-44 on Shaq Buchanan’s basket. It capped a surge the Racers needed to avoid getting blown out. But the surge by Murray State was fleeting. The Mountaineers scored nine of the next 10 points. Carter was the catalyst with a three-point play, and a steal where he found Logan Routt for a breakaway dunk and a 58-45 lead. Murray State never got closer than 11 the rest of the way. Published: March 16, 2018, 8:31 p.m.